Each year, a selection of current and former cricketers are invited to compete in the event by creating a course for 200 guests, for the evening which is hosted by Chance to Shine co-founder, Mark Nicholas. Last year’s winner, Stuart Broad, opened the dinner with a chicken liver parfait with a hat-trick of chutneys and potato flour bread. Mark Butcher followed this with a smoked haddock and salmon fishcake served with a watercress and pea salad and hollandaise sauce. Jonathan Agnew prepared the main course of herb crusted rack of lamb with crushed potatoes, black olives, ratatouille and a rosemary sauce. The dinner came to a close with Tipsy cake created by Greame Swann. 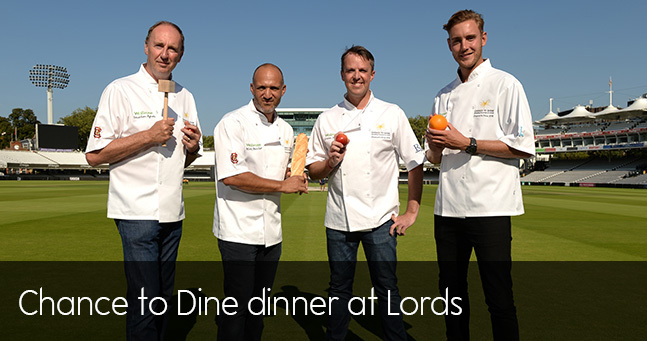 Each of the cricketers had their dishes scrutinised by the judges who were celebrity chefs, Ainsley Harriott and Ed Baines and food critic Giles Coran. The diners were then given the opportunity to vote for their favourite recipe from the menu to see who would be crowned the winning chef. See who was this year’s champion chef in the video below.